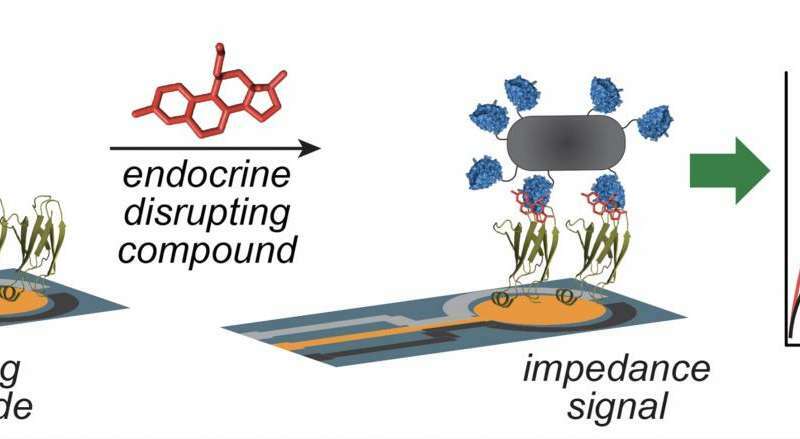 Researchers developed a device that uses E. coli cells expressing a protein receptor to rapidly detect the presence of many different endocrine disrupting compounds. Credit: American Chemical Society. Detecting EDCs can be tough because the classification is based on their activity—disrupting hormone function—instead of their structures. Thus the term encompasses a broad spectrum of chemicals and often, health risks arise from aggregate exposure to several different species. Because many EDCs act on the same hormone receptors on a cell's surface, researchers have been developing tests that detect the compounds based on their ability to interfere with hormones. But these methods currently take days to produce a result or involve many complicated and expensive steps. Here, Matthew Francis and colleagues overcame these challenges by using E. coli in their device. Endocrine disrupting compounds are found in increasing amounts in our environment, originating from pesticides, plasticizers, and pharmaceuticals, among other sources. Although the full impact of these compounds is still under study, they have already been implicated in diseases such as obesity, diabetes, and cancer. The list of chemicals that disrupt normal hormone function is growing at an alarming rate, making it crucially important to find sources of contamination and identify new compounds that display this ability. However, there is currently no broad-spectrum, rapid test for these compounds, as they are difficult to monitor because of their high potency and chemical dissimilarity. To address this, we have developed a new detection strategy for endocrine disrupting compounds that is both fast and portable, and it requires no specialized skills to perform. This system is based on a native estrogen receptor construct expressed on the surface of Escherichia coli, which enables both the detection of many detrimental compounds and signal amplification from impedance measurements due to the binding of bacteria to a modified electrode. With this approach, sub-ppb levels of estradiol and ppm levels of bisphenol A are detected in complex solutions. Rather than responding to individual components, this system reports the total estrogenic activity of a sample using the most relevant biological receptor. As an applied example, estrogenic chemicals released from a plastic baby bottle following microwave heating were detectable with this technique. This approach should be broadly applicable to the detection of chemically diverse classes of compounds that bind to a single receptor.